Episode #10 will be shown on ITV1 this coming Friday at 8:00 PM. For details of upcoming episodes, please visit the ITV Press Centre. 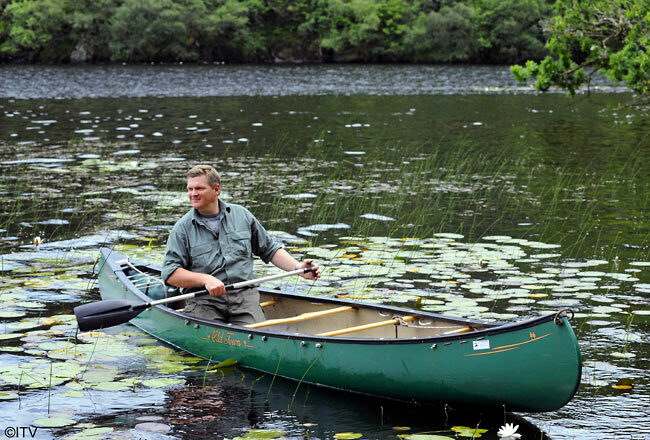 We are very excited to announce that the brand new third series of Wild Britain with Ray Mears has now begun on ITV1. What better way to start the new year than with a bit of Ray on the telly, eh? Starting on Friday 4th January, the series has returned with Ray guiding us around the many varied habitats of Great Britain, exploring the landscape and wildlife these areas have to offer. The first episode revoled around the Isle of Mull; situated off the west coast of Scotland, the island is home to over 250 different wild bird species, a thriving otter population, and counts sharks, whales, porpoises and dolphins among the range of sea life found off its shores. This entry was posted in Ray Mears, Site Announcements on December 20, 2012 by Woodlore Team. A wonderfull series sadly comes to an end. Ray’s last comments on Wilderness reconnecting us to our true being and purpose are very, very true. The modern Human is incredible disconnected from Mother Nature and the fellow creatures we share this life with. They sleep suspended in a house, on man made materials, awake to put on rubber shoes, walk out of their house onto concreate, then into work, a building usually suspended above the Earth once again, for 6-7 hours, then back back home. Not once during the day touching the soil of the Earth. Wonderful series showing off all my favourite places! I would really like to know where the music comes from as there is a string piece played almost every week which is rather beautiful but I cannot seem to find out what it is. Keep up the good work and hope you secure a DVD release for S3! Another fascinating episode tonight – i’m really enjoying the series! Experiences with wild, tame animals are pure magic. 2 years ago I was sitting in the forest relaxing to the bird-song when I heard a twig snap to my side. I looked over and there was a beautiful, wild red squirrel going about his business less than 3-4 meters away, completely at peace with my presence. I’ve really enjoyed the Wild Britain series’. I wish they were on for an hour though – half hour episodes are frustratingly brief (especially when you take out opening/closing titles, and the commercial break). But I have thoroughly enjoyed them. Each episode leaves me eager to get out there. Here’s a request though. If there’s another series any chance of covering the Dungeness/Romney Marsh area in Kent? It’s a unique and valuable environment with some of the largest areas of shingle beach in the UK. I’m loving wild britain. I would like to know if possible the song played in episode 6 the argyll rainforest where ray is watching the beavers. A beautiful piece of music to an awesome series. I just wanted to say how much I am enjoying your Wild Britain series. Perhaps ITV could be persuaded to give you an hour each week for the next series? It is reassuring to see television stations, other than the BBC, starting to take the importance of wildlife programming seriously. Thank you for sharing your enthusiasm and depth of knowledge. About tonight’s program. I hear pine martins are stated as controversial because of raiding song birds nests. I think this statement is a little controversial in its self. I think the damage done to the song bird population is totally insignificant to that done by the 8 million or so cats in the UK. It bewilders me how so many of our native species get the blame for song bird population decline but no one seems the least bit bothered about cats!! Hi Woodlore, sorry if this has been answered before but I can’t see it….Q. when will this new season (3) of WILD BRITAIN be our on DVD please? It doesn’t even get a mention on Amazon etc so I’m wondering if oohing is in the pipeline ? At present I’m afraid that ITV have not confirmed whether this series will be released on DVD or not. We will most likely have a clearer answer once the final episode has been broadcast. a.) There are loads of UK ex-pats here who’d watch it. c.) Some (not all) Australians are Anglophiles and would eat it up. I’d like to thank Ray and crew for all of their hard work to deliver some of the most informative, cheerful, and enjoyable programming that television has ever had. I loved the feel during the second half while watching the birds at the river. No music; just Nature’s own soundtrack. It had a wonderfull atmosphere – alot like the old Bushcraft episodes! PS. Ray falling over gave me quite a chuckle haha. I really enjoyed last nights episode. Some of the best Badger footage i’ve ever seen! I’m interested to know where Ray sourced the Lichen & Rock pattern hide he used for Otter spotting, can anyone help? Does anyone know which company supplied the THROW over hide Ray used up in Mull to watch the otters at the end of the programme ??? Excellent, great to see Ray Mears back on TV. My only criticism is that the episodes are too short! loved the program, inspiring stuff. where can you get the camouflage bivi that he used for otter spotting? Enjoyed tonight’s episode but still only the first episode on DVD come on where’s the rest? Looking forward to seeing Ray again on TV tonight, just wish his programmes were on the BBC as the adverts and half hour slot are a little frustrating. I’m really looking forward to tonights episode, and this series. The last two series have been brilliant. Ironically, given programme 1 is on the beautiful island of Mull, it’s not being shown on STV. Any ideas when we can expect the series in Scotland please? Fantastic news. I wish you all a happy new year. Woodlore, where can I watch Ray Mears’ Wild Britain series 2? It’s not on Youtube and it’s obviously not been released on DVD.